Thought we knew every part of the human body? Think again. Surgeons in Belgium recently discovered a new ligament in the human knee. Publishing their research in the peer-reviewed Journal of Anatomy, the knee specialists provided the first anatomical description of the fibrous tissue, called the anterolateral ligament, or ALL, for short. Though French surgeon Paul Segond proposed the existence of an additional ligament in the human knee as early as 1879, the structure evaded classification for many years. Working from the French surgeon’s notion, the team, led by the University of Leuven’s Dr. Steven Claes, dissected cadaver knees in search of the “pearly, fibrous band” Segond described. What they found was a “well-defined ligamentous structure” that connects the femur (thighbone) with the anterolateral tibia (shinbone) in 40 of the 41 human knees they dissected, the authors wrote in the study. 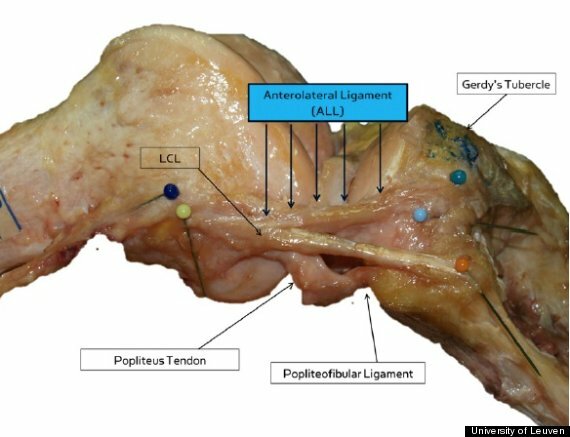 While the anatomical description of the anterolateral ligament is significant since it finally solidifies the existence of the structure, the team also uncovered another, perhaps more important, feature of the tissue. It appears the ligament may play a pivotal role among patients with anterior cruciate ligament (ACL) tears — the bane of athletes in basketball, skiing, and other sports that require lots of pivoting movements. As part of the research, the team hypothesized that the anterolateral ligament affects the pivot shift of the knee. This phenomenon, which causes knees to give out even after a successful ACL repair, may be brought on by an injury to the anterolateral ligament, the researchers said in a written statement. Though more research will be needed to confirm the researchers’ hypothesis, the proposed link between the anterolateral ligament and the pivot shift may hold some hope for future ACL treatments.